Acute pericarditis is an inflammation of the pericardium. This inflammation causes EKG changes that have typically evolved sequentially through 4 stages1. Acute Pericarditis can be difficult to distinguish from ST-segment Elevation Myocardial Infarction. Although clinical and EKG findings of both diseases seem different, providing a complete assessment may be difficult in clinical practice. Chest pain is the most common symptom of pericarditis, it is most often sharp and pleuritic in nature. Usually it is precordial or retrosternal, with exacerbation by inspiration or coughing, and it decreases in intensity when the patient sits up and leans forward. Common associated symptoms include fever, dyspnea, cough or symptoms of viral infection. The presence of a pericardial friction rub on physical examination is pathognomonic for acute pericarditis. It is generated by friction between the two inflamed layers of the pericardium. It has a scratching, grating sound similar to leather rubbing against leather. Friction rubs tend to vary in intensity between different auscultations 2. Neoplastic: Primary tumours (pericardial mesothelioma). Secondary metastatic tumours (lung and breast cancer, lymphoma). Metabolic: Renal insufficiency, Hypothyroidism, anorexia nervosa. Drug-induced: Hydralazine, procainamide, methyldopa, isoniazid, antineoplastic drugs. Other: Amyloidosis, aortic dissection, pulmonary arterial hypertension and chronic heart failure 3. An Electrocardiogram should be performed when there is suspicion of acute pericarditis. EKG may be diagnostic in acute pericarditis, changes might occur within a few hours of the onset of symptoms, but changes are not always present. Serial Electrocardiograms are helpful in patients with acute pericarditis because it causes characteristic 12-lead ECG changes that have typically evolved sequentially through 4 stages 1 2. Concave ST elevation, PR segment depression, positive T wave. Changes occur within a few hours of the onset of symptoms. On the Electrocardiogram is mainly characterized by diffuse concave ST segment elevation in almost all EKG leads (except V1 and aVR) and absence of reciprocal ST segment changes. Diffuse PR segment depression can also occur (read differences between Intervals and Segments). This electrocardiographic sign is more specific for acute pericarditis, although it is less sensitive. At this stage, T wave remains positive in most of the EKG leads. Normalization of the ST segment, T wave flattening. At this stage, Electrocardiogram changes occur several days after the onset of pericarditis symptoms. It is characterised by the normalization of the ST segment and widespread T wave flattening. Electrocardiogram changes return to normal. At this stage occurs the normalization of T waves and the EKG returns to the normal pattern. This stage may last up to three months, but T wave inversions may persist indefinitely 4. One or more stages of the EKG changes may be absent 5. In fact all four stages are present in only 50% of patients or less. Occasionally, it may indeed be difficult to distinguish these EKG changes from those of ST-segment Elevation Myocardial Infarction (STEMI) 1. Useful clues in differentiating acute pericarditis from STEMI are ST segment shape, reciprocal ST depression, PR segment deviation, abnormal Q wave, R wave voltage, T wave concordance with ST segment. In acute pericarditis, the ST segment elevations is diffuse, in STEMI, the ST segment elevation is localised to the distribution of the affected coronary artery. Reciprocal ST segment changes are absent in acute pericarditis (except V1 and aVR) and present in STEMI. ST segment elevation in Acute Pericarditis is concave-upward, whereas in STEMI is convex-upward. Diffuse PR segment depression affecting virtually all leads (except V1 and aVR ) is a quasispecific finding in acute Pericarditis, but it is absent in STEMI. Abnormal Q waves are absent in pericarditis but they are present in myocardial infarction. Poor R wave progression may be a finding in STEMI but is not a characteristic in Acute Pericarditis 1. In Acute Pericarditis, T wave is always concordant with ST segment. Discordance between T wave and ST segment is characteristic of Myocardial Infarction 1. Early Repolarization Pattern is a common EKG finding in young healthy men and can be difficult to differentiate from Acute Pericarditis. Useful clues in differentiating early repolarization from acute pericarditis are PR segment deviation, terminal QRS slurring, EKG changes evolution, ST/T ratio. PR segment depression is absent in Early Repolarization. 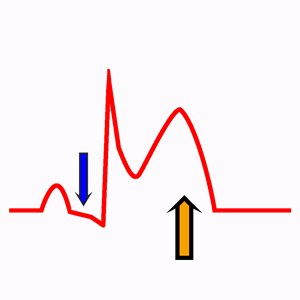 Early Repolarization Pattern is characterized by terminal QRS slurring or notching (J wave). In the absence of these EKG findings, diagnosis of Early Repolarization is doubtful. In acute Pericarditis, T wave has normal amplitude, but are usually peaked in early repolarization. An ST/T ratio <0.25, especially in lead V6, denotes early repolarization. Characteristic sharp, pleuritic chest pain. A new or worsening pericardial effusion. Elevation of markers of inflammation (i.e., C-reactive protein, erythrocyte sedimentation rate, and white blood count). Evidence of pericardial inflammation by an imaging technique (CT, CMR) 3. Chest X-ray is generally normal in patients with acute pericarditis since an increased cardiothoracic ratio only occurs with pericardial effusions exceeding 300 ml 3. Incessant Pericarditis: Pericarditis lasting for >4 – 6 weeks but <3 months without remission. Recurrent Pericarditis: Recurrence of pericarditis after a documented first episode of acute pericarditis and a symptom-free interval of 4 – 6 weeks or longer. Chronic Pericarditis: Pericarditis lasting for >3 months. Patients without high-risk features and specific etiology could be managed as outpatient with empiric anti inflammatory therapy and then followed after 1 week. Patients who exhibit at least one high-risk prognostic factor are warranted to be hospitalized. These risk factors are divided into major (based on multivariable analysis) and minor (based on expert opinion). High fever (>38 °C/100.4 °F). Large pericardial effusion (>20 mm on echocardiographic study). Failure to respond within 7–10 days to nonsteroidal anti-inflammatory drugs (NSAIDs)3. Recurrent pericarditis is diagnosed with a documented first episode of acute pericarditis, a symptom-free interval of 4–6 weeks or longer and evidence of subsequent recurrence of pericarditis. Diagnosis of recurrence is established according to the same criteria as those used for acute pericarditis 3. The recurrence rate after an initial episode of pericarditis ranges from 15 to 30%, and may increase to 50% after a first recurrence in patients not treated with colchicine. Cardiac tamponade is a life-threatening compression of the heart due to the pericardial accumulation of fluid. Clinical signs in a patient with cardiac tamponade include tachycardia, hypotension, pulsus paradoxus, raised jugular venous pressure, muffled heart sounds, decreased electrocardiographic voltage with electrical alternans and an enlarged cardiac silhouette on chest X-ray. The magnitude of clinical and haemodynamic abnormalities depends on the rate of accumulation and amount of pericardial contents, the distensibility of the pericardium and the filling pressures and compliance of the cardiac chambers. In patients with cardiac tamponade, the EKG may show signs of pericarditis, with especially low QRS voltages and electrical alternans 3. Constrictive pericarditis can rarely occur after recurrent pericarditis. It is characterized by impaired diastolic filling of the ventricles due to pericardial disease. The classic clinical picture is characterized by signs and symptoms of right heart failure with preserved right and left ventricular function in the absence of previous or concomitant myocardial disease or advanced forms 3. Any clinical presentation that may suggest an underlying etiology or with at least one predictor of poor prognosis warrants hospital admission and an etiology search. On the other hand, patients without these features can be managed as outpatients with empiric anti-inflammatories and short-term follow-up after 1 week to assess the response to treatment 3. In patients identified with a cause other than viral infection, specific therapy appropriate to the underlying disorder is indicated. Exercise restriction should be considered for non-athletes with acute pericarditis until resolution of symptoms and normalization of CRP, ECK and echocardiogram. For athletes, the duration of exercise restriction should be considered until resolution of symptoms and normalization of CRP, EKG and echocardiogram, at least 3 months is recommended 3. Aspirin or NSAIDs are recommended as first-line therapy for acute pericarditis with gastroprotection. Colchicine is recommended at low, weight-adjusted doses to improve the response to medical therapy and prevent recurrences. Tapering of colchicine is not mandatory but may be considered to prevent persistence of symptoms and recurrence 3. Low-dose corticosteroids should be considered for acute pericarditis in cases of contraindication or failure of aspirin/NSAIDs and colchicine, and when an infectious cause has been excluded, or when there is a specific indication such as autoimmune disease 3. Corticosteroids are not recommended as first-line therapy 3. Remember: EKG changes of Acute Pericarditis may indeed be difficult to distinguish from those of Myocardial Infarction and Early Repolarization 1. 1. Ariyarajah V, Spodick DH. Acute pericarditis: Diagnostic cues and common electrocardiographic manifestations. Cardiol Rev. 2007 Jan-Feb;15(1):24-30. doi: 10.1097/01.crd.0000210645.89717.34. 2. Shabetai R. El Pericardio. J&C Ediciones Médicas, S.L. ; 2005. 3. Adler Y, Charron P, et al. 2015 ESC Guidelines for the diagnosis and management of pericardial diseases. The Task Force for the Diagnosis and Management of Pericardial Diseases of the European Society of Cardiology (ESC). Eur Heart J (2015) 36 (42): 2921-2964. doi: 10.1093/eurheartj/ehv318. 4. Khandaker MH, Espinosa RE, et al. Pericardial Disease: Diagnosis and Management. Mayo Clin Proc. 2010 Jun; 85(6): 572–593. doi: 10.4065/mcp.2010.0046. 5. Surawicz B, Knilans TK. Chou’s electrocardiography in clinical practice, 6th ed. Philadelphia: Elservier; 2008. 6. LeWinter MM. Acute Pericarditis. N Engl J Med 2014;371:2410-6. doi: 10.1056/NEJMcp1404070. If you Like it... Share it. My EKG team recomends you the books that we used to create our website.